Climbing Roses, considered wild roses, climb on almost everything and need constant training. With basic care, you can enjoy your healthy, beautiful Climbing Roses year after year. In our DIY Garden Minute Ep. 57 - "Climbing Roses - A Quick Care Guide," we'll explain basic facts about Climbing Roses and tips to keep them maintained and healthy. This episode is meant for any level of gardener who wants to learn about the Climbing Roses in their yard. For our "Prune Like a Pro" free cheat sheet, click here! Climbing roses are actually wild roses. Roses climb by being trained either through a structure or being tied to a structure. If left untrained, they will climb up any and everything, if given the chance. Climbing Sports of bush roses. The large-flowered climbers usually produce more flowers, but the climbing sports present the more vibrantly colored flowers. These beautiful plants can produce flowers in colors of red, pink, orange, yellow, or white. Regular pest prevention and surveillance. For more information about Roses in general, check out Roses: A Gardener's Guide and Plant Profile. As with most plants, climbing roses will need some TLC once in a while to keep them healthy. They require constant pruning and training so they don't get too rangy. Only start pruning your roses about 2-3 years after they have established, removing the oldest canes. In general, only prune spring-flowering climbing roses just after they have finished flowering. It is okay to prune continual-blooming Climbing Roses at the same time you would prune the shrub type of rose in your local area. Whether you already have Climbing Roses in your garden, or you are looking to purchase your first plant, we've gathered a selection of best-selling plants for you to choose from. If you have a bare arbor or unattended trellis, try planting a Climbing Rose and watch it grow! Also, we've included a couple of products that can help you care for your roses. Climbing Roses are a beautiful addition to any garden. They prefer the full sun and some are even winter hardy. By learning how to train and prune your roses, you can prolong their life for years of growth. That's all for this DIY garden minute episode! Print your FREE Rose Plant Profile! Subscribe to our Spoken Garden community and receive your FREE Rose Plant Profile! Included in the plant profile: Rose general plant info, fast facts, companion plants, and a planning guide! 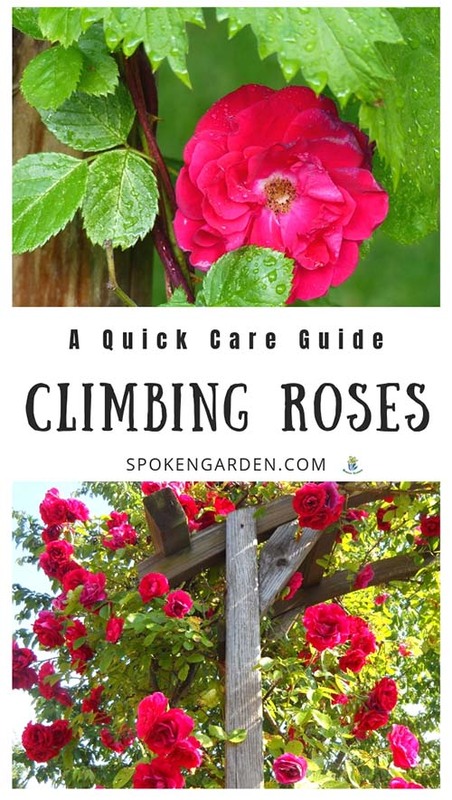 Click the graphic above to save "Climbing Roses Quick Care Guide" to Pinterest for later! Learn what a Climbing Rose is and how to properly care for it! All sorts of maintenance and care tips to keep your Climbing Roses healthy.